You may recall, from posts of old, that I started sewing in early fall of 2012. After taking a handful of classes at the local JoAnn, I signed up for Sewing 301: Dressy Jacket. Well, it may have been a little out of my league. And by a little, I mean a lot. Never one to purchase fabric as directed (read: ugly), I chose something I would actually wear. This meant making the entire sewing process infinitely harder on my very beginner self. (Things like matching pattern, no right-side/wrong-side of the fabric, slipperiness, resistance to ironing creases, the list goes on.) I should I have chosen something practical and amenable to my skill level. Well, I didn’t. (Indicative of a behavioral pattern?) So, after a few hours of homework, and two three-hour long class sessions, I was left with most of a torso, two miss-sewn sleeves, some large Liberace-esque cuffs, and a LOT of frayed edges. (On all fronts.) I also had a partially formed inner layer to the jacket. I can’t tell you how many times I took a part the sleeves on that damn thing. To add insult to injury, this fabric is a chronic unraveler, so every time I worked on this project, I would end up covered, COVERED, in small white threads. Cut to November 2013 – a year and some change later, having failed at a pair of pants and looking for some closure, I fished the scraps out of the ugly hand-made tote bag where they had been hiding in shame. Out of sight but not totally out of mind. “Oh, so you failed at one project that was too hard, so you decided to dig out another in order to make yourself feel better? That totally makes sense.” Well, um, yes. But this time I was VICTORIOUS! The lesson I learned is more involved and less interesting than one might hope. 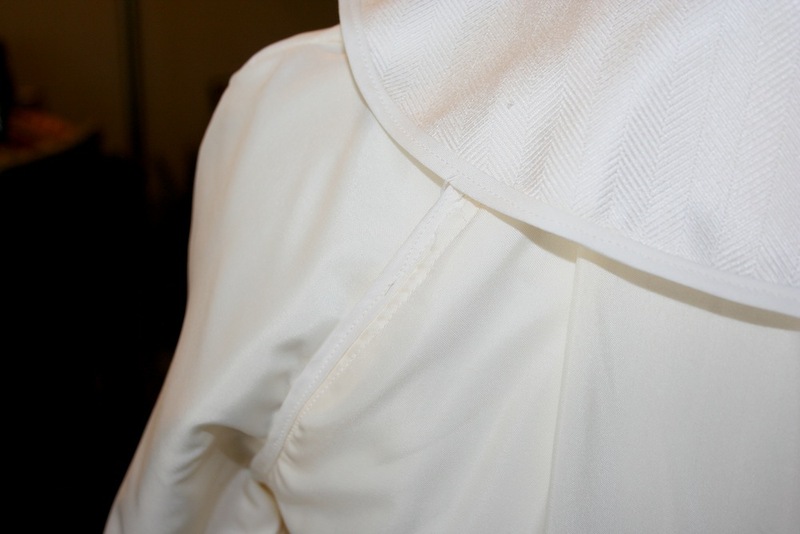 Turns out, the front and back-sides of sleeves is a really important feature. I can only compare it to trying on a mitten on the wrong hand. Its seems obvious, but when there are a handful of pieces in various states of disarray, not so much. 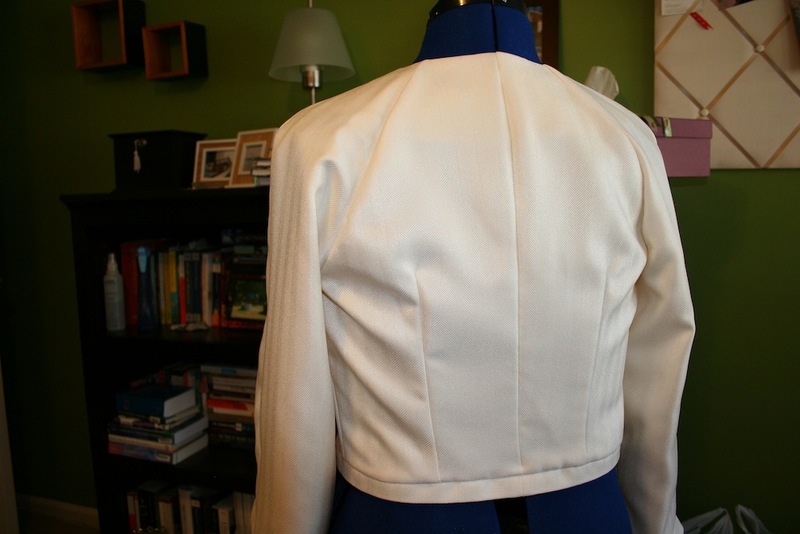 The end result is a cropped ivory herringbone jacket, reminiscent of Jackie O. So there it is, my unicorn (that elusive creature whose very existence is questionable) has been captured. For now. I’m sure there are other projects that will languish in the shadows waiting for me to gather the gumption to finish them. Like those pants. After this project, I decided to ask for a pressing ham for Christmas. Yes, a pressing ham. 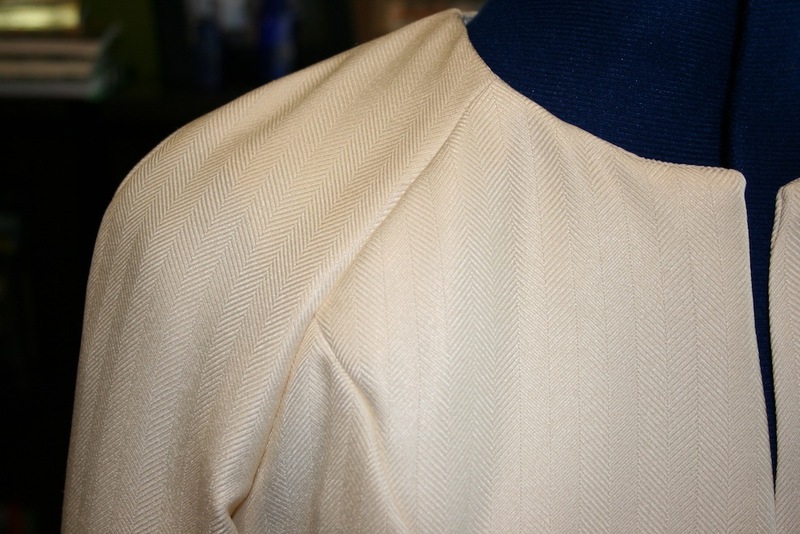 I love the seams on the back of the jacket, it fits like a glove. As all custom work should. 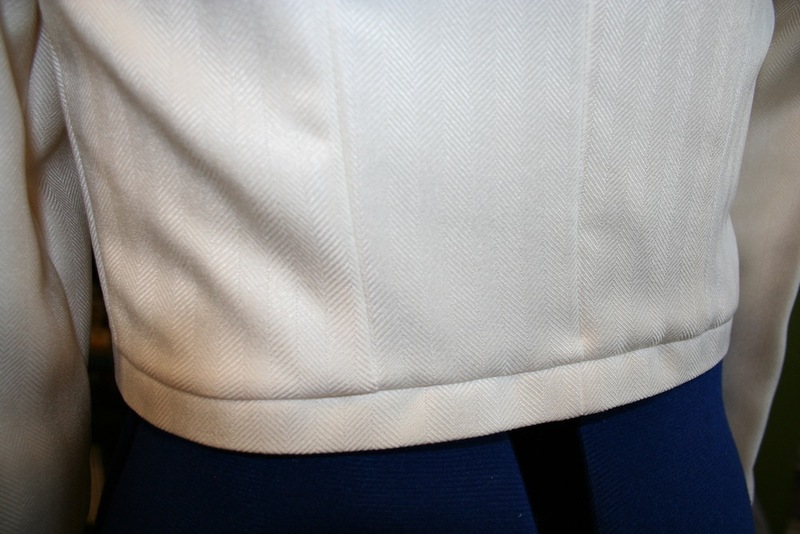 Given all the trial and error, the jacket ended up a tad shorter than I wanted, so I added a one-inch hem at the bottom rather than a traditional dress or blind hem. Something I’ve gathered in my sewing education (sewing pun intended) is that you can really tell the quality of work by what’s on the INSIDE. With that, I’m pretty proud of most of the finishing work I did inside the jacket. I used a double-fold bias tape on all the internal seams, which was something I had never used before. 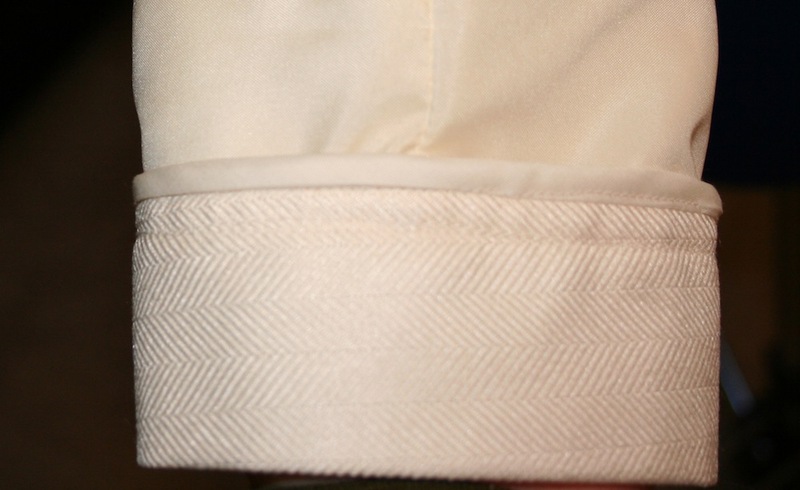 The inside of the sleeve and attached cuff. Like an actual unicorn, the whole of this jacket refused to be photographed. In reality, I plain old forgot to take a picture of the front. I did wear it to a wedding this past weekend, which was fun. No pictures there, either. Sheesh.